Wingspan 22 to 27 mm. Distinguished by its single, white longitudinal streak against a brownish background. This species is local in dry or sandy areas, being commoner near the coast. It flies in July and August and is nocturnal. Distributed in the southern half of Britain, and in some parts of Scotland. 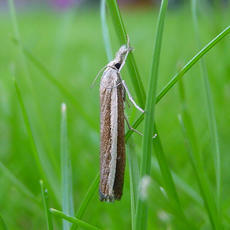 In the Butterfly Conservation's Microlepidoptera Report 2011 this species was classified as local.